4 To The Floor is the label committed to delivering classic house staples to those who are willing to dig a little deeper for their music fix. 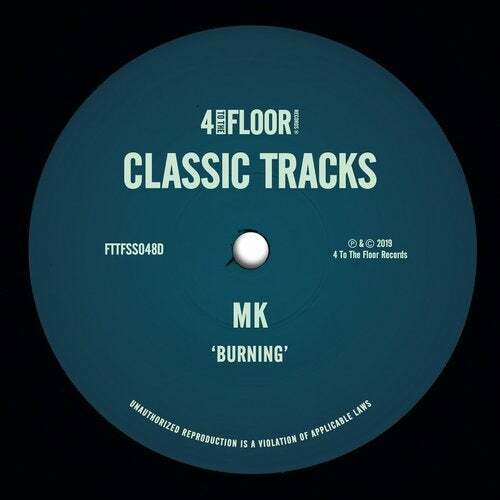 MK's 'Burning' is a record that embodies the classic house ideals, with its unmistakable vocal hook and energised beat. Re-packaged for 2019, 4TTF bring new life to MK's vocal house masterpiece in this release, featuring the Vibe Mix in all its glory, along with MK's Underground Vibe Mix, that delivers exactly what it says on the tin. Other standout mixes include the DeKalb mix, which brings a real Balearic vibe to the record, and Sonny Fodera's thunderous remix, where he brings his signature rolling house sound to the track.